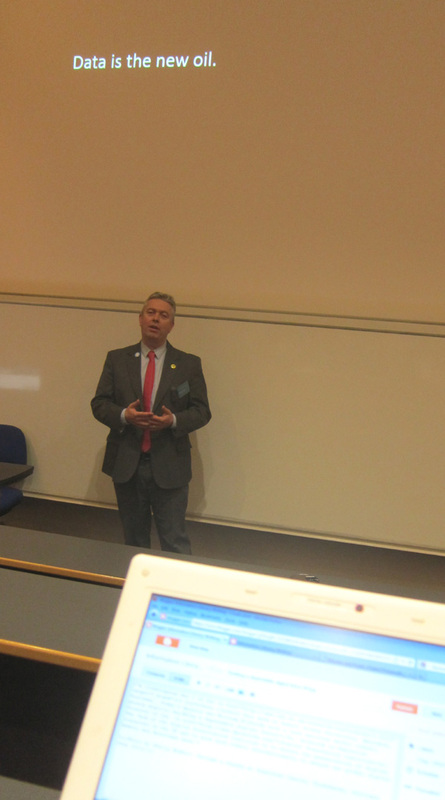 I’m liveblogging day 2 of the i3 conference held this week at Robert Gordon University, Aberdeen, Scotland. Today's keynote was William Kilbride with a talk entitled Sic transit gloria digitis: building a dependable digital future?. As usual, this is liveblogging, so it is just my impression, and as this is not a core area of mine, apologies for mistakes! Kilbride is Executive Director of the Digital Preservation Coalition. The "aim of the Digital Preservation Coalition is to secure the preservation of digital resources in the UK and to work with others internationally to secure our global digital memory and knowledge base." He started by exploring the phrase "data is the new oil": was data abundant? was it inexhautible? could useful information be easily extracted? He identified the problem of web links disappearing: in particular giving the example of information used to respond to parliamentary questions i.e. information that it is important to be able to refer to for a period of time. Thus he characterised data as fragile. Kilbride went on to talk about myths of digital preservation. He referred to an article by Chris Rusbridge which discussed these myths, and he focused on a few of them. For example "file formats are always changing". However, it is more nuanced than this: there are more robust formats, proliferating formats (e.g. types of .tif) etc. Kilbride then cited a paper by Malcolm Todd. Todd proposed on managing data flows and having a preservation strategy focused on your own capacity and needs. This was more important that worrying about controlling file formats. Kilbride looked at the issue of whether digital preservation was expensive. It is often perceived as expensive, but restoring and preserving physical documents, objects and structures tends to be more expensive. He contrasted the cost of the Archaeology Data Service website with the cost of preserving the items in the museums collection of a major city. At this point Kilbride mentioned the 4Cproject http://4cproject.eu/ (Collaboration to Clarify the Costs of Curation). He discussed issues around metadata e.g. should the data be characterised before it goes into the repository, or can you leave it til it's in the repository? With changes in the types of data etc. the data may need to be recharacterised: Kilbride posed the question - at what point does metadata become a problem rather than a solution? An interesting conclusion was that he could "no longer distinguish" between data, systems and services (he gave the example of cloud computing being a service rather than a product). They were becoming interdependent, and this meant some rethinking of what data was and how you preserve it: what is it you were wanting to preserve? It was also important to remember why you were preserving data and to think about the people factors (perhaps coming back to the socio-cultural perspective mentioned by Olof Sundin in the first keynote).